For the Sill Family which has operated a vineyard in the Napa Valley for over 20 years, the tragic fires that hit them in early October could never have been imagined. The Atlas Peak Fire and surrounding fires caused so much damage, displaced so many thousands, and taken far too many of Napa’s community that it’s difficult to find the words to describe their grief. Their wounds feel as raw today as they did just a few short weeks ago, and they fear they may never be completely healed, as they understand that far too many are still struggling now and will continue to struggle in the years to come. If there has been anything to provide hope in these trying times, it has been the outpouring of community support the Sills have witnessed in Napa Valley — from family and friends, yes, but from strangers and good Samaritans alike. From people who read the news from far away or those in their own community who bravely fought the fires or offered a helping hand. As the Sills rebuild their Atlas Peak mountain winery and look forward to better days, they have been touched beyond measure by the support, grace and kindness of so many. In response to this crisis, their friend, Marc Benioff, founder and CEO of San Francisco-based Salesforce, is leading a coalition of Bay Area business and community leaders to support long-term recovery and rebuilding. This effort kicks off with a benefit concert on Thursday, November 9th with the best seats going to first responders, volunteers, and others impacted by the fires. 100% of ticket sales will be directed to the Tipping Point Emergency Relief Fund, supporting community partners working on the front lines to help those hit hard and includes grants to Community Foundation Sonoma County, Napa Valley Community Foundation, the North Bay Fire Relief Fund established by The Press Democrat, and Catholic Charities of Santa Rosa. The Napa Valley Community Disaster Relief Fund, which was established with a $10 million lead gift from Napa Valley Vintners after the 2014 South Napa Earthquake, has been offering money and support to those affected by the fires. They mobilize resources, inspire giving, build knowledge and provide leadership on vital community issues to improve the quality of life for all in Napa County. They are also supported by hundreds of local givers and have attracted several million dollars in additional resources from other foundations, including: The California Endowment; The California Wellness Foundation; The James Irvine Foundation; The David & Lucile Packard Foundation; and The William & Flora Hewlett Foundation. 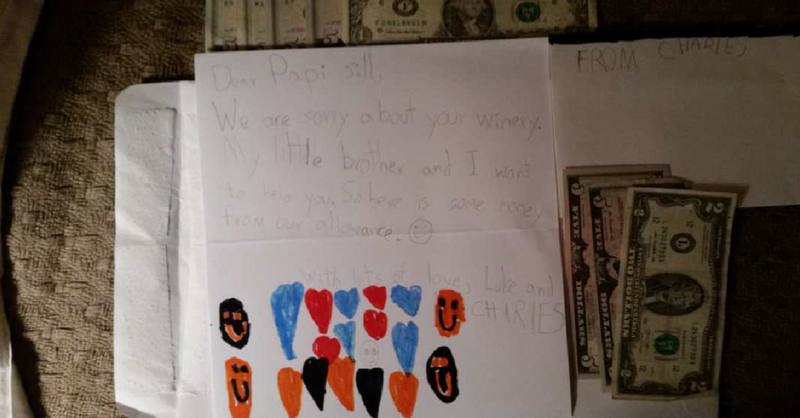 And perhaps best of all, in an act of kindness that brought the Sills to tears, two young boys from the kindergarten class their daughter used to teach in San Francisco mailed them a note and included money from their own allowances. Thank you, Luke and Charles A. You have truly touched their hearts and given them so much hope. So, the Sills will rebuild. That’s what they do. That’s what Napa Valley has always done, whether through harsh winters, droughts, pests, earthquakes, or, whatever else is thrown at them. Napa has met challenges before and this one has unfortunately touched so many. But, they can’t help but also dwell on what has always pulled Napa through the community support and Napa spirit here and beyond; the donations, the volunteerism, the hard work. And, for the Sills, that very special envelope from two young boys with a truly thoughtful note and a few dollars from each to let them know it will all be OK again. We have a feeling they’re right. NAPA, CA – The Atlas Peak Appellation Association (APAA), a nonprofit organization of wineries and grape growers in the Atlas Peak American Viticulture Area (AVA), has announced the election of a new board of directors. Chelsea Bellows, vice president of operations at Alpha Omega Winery, will serve a second term as APAA’s president. Also filling their roles for a second year are Bob Liems, owner and winemaker at Atlas Peak Wine Labs, as vice president; Rick Thornberry, proprietor of Soda Canyon Ranch Vineyards, as treasurer; Gabrielle Shaffer, chief viticulturist at Stagecoach Vineyards, as secretary; Celeste Cooper, consumer direct sale manager at Black Stallion Estate Winery, as director-at-large; and Joseph Reisdorf, president of MDM Analytics, as director-at-large. Newly elected board members include Victoria Coleman, winemaker at Lobo Wines; Bob Almeida, proprietor of Lagniappe Peak Vineyards; Domenick Bianco, viticulturist; and Angelina Calvelli, graphic designer. Coleman, a graduate of the UC Davis enology program, began her career at Stag's Leap Wine Cellars as a production assistant. She moved to China to work at Jade Valley Winery near Xian and studied classic, Old-World winemaking in 2008 with Erick Tourbier at Chateau Mouton Rothschild in Bordeaux, France. At Lobo Wines, her focus is on Cabernet Sauvignon and Pinot Noir. management companies, followed by work as a cellar intern at Etude Wines. He then accepted a position as viticulturist and vineyard development manager at Renteria Vineyard Management. A developer of more than 300 acres of vineyards, Bianco currently works for HALL and WALT wines as their viticulturist and grower relations manager. Calvelli launched her career in the wine industry as a marketing and sales intern at Constantia Glen Winery in Cape Town, South Africa. She worked as a tasting-room associate at Stolo Family Winery in Cambria before taking the position of marketing coordinator at Alpha Omega Winery in Napa. She currently serves as marketing assistant at The Carneros Inn, and also works as a freelance graphic designer. All board positions are effective as of January 12, 2016, and officers and members will serve a one-year term. The Atlas Peak Appellation Association brings together the wineries, growers, and friends of the Atlas Peak American Viticulture Area (AVA) to share information, strategize marketing concepts, and promote the wine made from grapes grown in the region. Its goal is to expand the visibility and notoriety of the Atlas Peak AVA and to educate consumers about the unique characteristics and exceptional quality of Atlas Peak wines. Home to Napa Valley’s most highly elevated and rugged landscape, Atlas Peak has been producing wines of renown since 1870. The 11,400 acres of land that comprise the AVA include 1500 acres of vineyards. Once known primarily for Zinfandel, the Atlas Peak appellation currently produces premium varietals used to create Bordeaux-style wines, such as Cabernet Sauvignon, Cabernet Franc, Petite Verdot, Malbec, and Merlot. Grapes grown in the region also include Rhone-style Syrah, Marsanne, Sangiovese, Chardonnay, and Sauvignon Blanc. Website design by Angelina Calvelli.